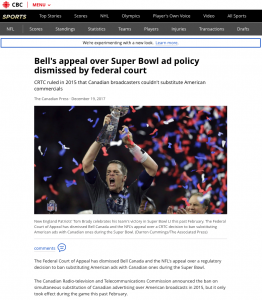 » Peter A. Allard School of Law » Home » 2018 » January » 09 » Question of the Week (Class 2): U.S. Super Bowl Commercials on Canadian TV – Good, Bad, or Indifferent? 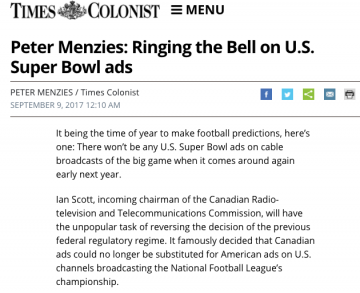 Question of the Week (Class 2): U.S. Super Bowl Commercials on Canadian TV – Good, Bad, or Indifferent? 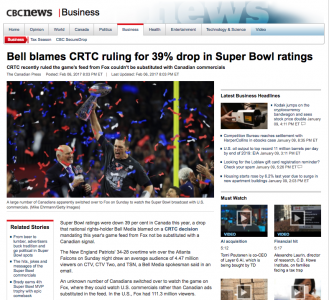 Journalistically one should never “bury your lead”, so the story above (click on it) tells you the current state of play. This rather odd issue is useful in identifying and focussing us on some of the orthodoxies and traditional tensions in our national broadcasting and communications – particularly questions of culture, profit, and censorship. The question itself may be most useful as a kind of Rorschach test on which we can all project our pre-existing perceptions and biases. 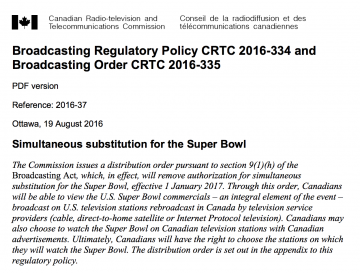 So should the CRTC stay its most recent course and let us watch Super Bowl Commercials in the game between the Eagles and the Patriots on February 4, 2018? 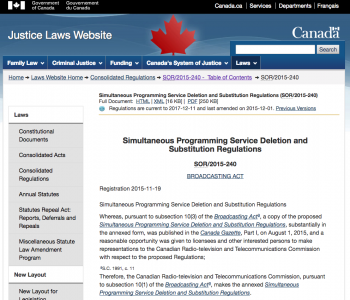 Or should they revert to their traditional policies?